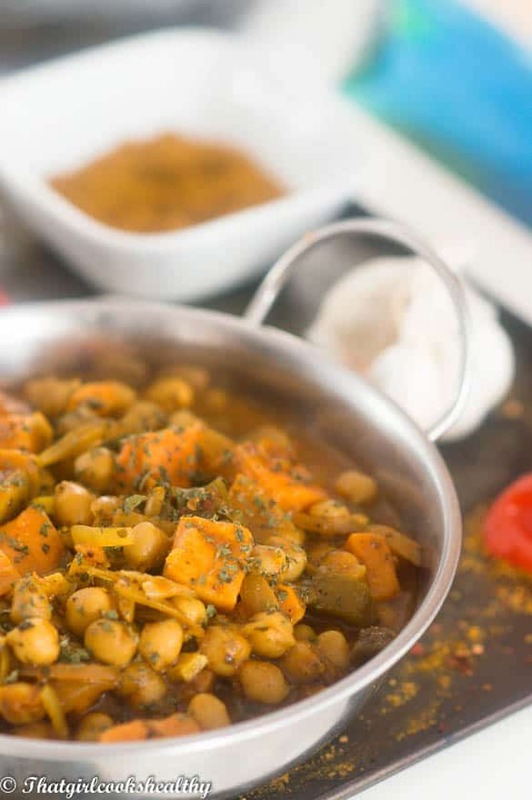 Vegan chickpea curry recipe – a tasty legume based vegan style curry made with high protein chickpeas and sweet potatoes. 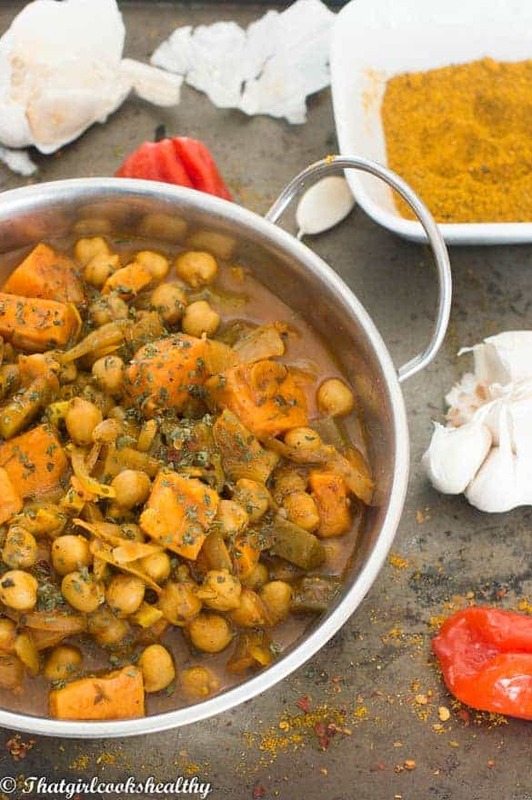 Who doesn’t love a good ole one pot chickpea curry? I know I do! More importantly who enjoys nothing more than a slow cooked easy vegan chickpea curry. This spice infused low fat curry is true gluten free vegan heaven especially with the additional use of sweet potatoes creating a uber filling family meal. Although the word curry in English means a dish that is prepared with an array of complex spices, in Southern Asian region, curry doesn’t really have a true meaning. The vast majority Indian cooking is made up of dishes with herbs and spices, so there isn’t a spice word to describe a “curry”. With that being said, because the word “curry” is very popular in the British vocabulary, I too have somewhat embraced the word and use it to my leisure, though being acutely aware of its non existence to the South Asian population. Here in you UK you will find a large quantity of “curry houses” – a word used to describe take away style Indian cuisine. I’ve visited a few and the taste/flavours always seem to blow me away, almost to the point where I made a pledge to myself to try my hand at Indian style recipes. Plant based vegan chickpea curry is the real deal! 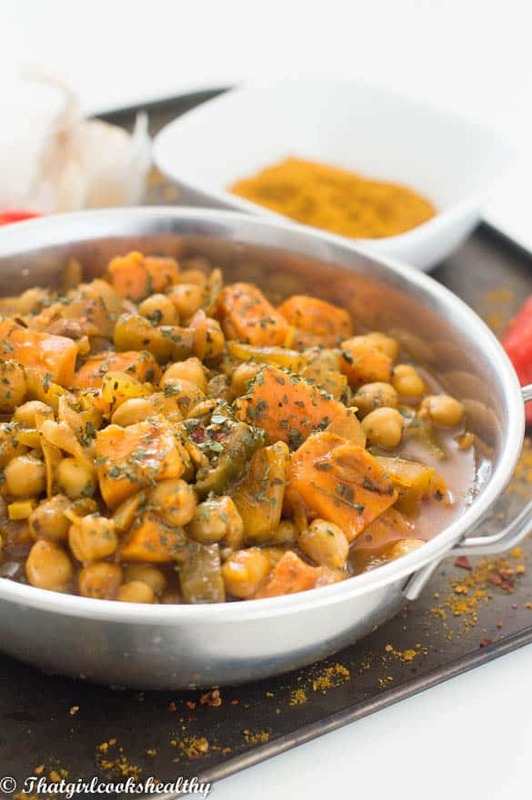 When it comes to curries granted I love chicken dishes but second in line has to be my favourite plant based protein – chickpeas. Let me introduce this hearty chickpea curry. One that isn’t too complex and very VERY VERY tasty might I add. When cooking with a number of herbs and spices, the key to success is to find that balance of herbs/spices that are complimentary in taste – use too much and the results can be an overpowering taste of curry and the use of too little makes the dish bland. Luckily for you, my lovely readers I have completed all aspects of trial and error. All you need to do now is grab what is listed and follow the instructions. Yellow curry paste – The curry paste is made by using my Jamaican curry powder and water mixed together. 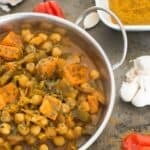 How many calories in chickpea curry? Slow cooker – Saute the onion and garlic first, then add all of the other ingredients to the slow cooker and cook on high for 4 hours. Instant pot version – cook the onion/garlic using the saute option, add the rest of the ingredients, switch valve to seal. 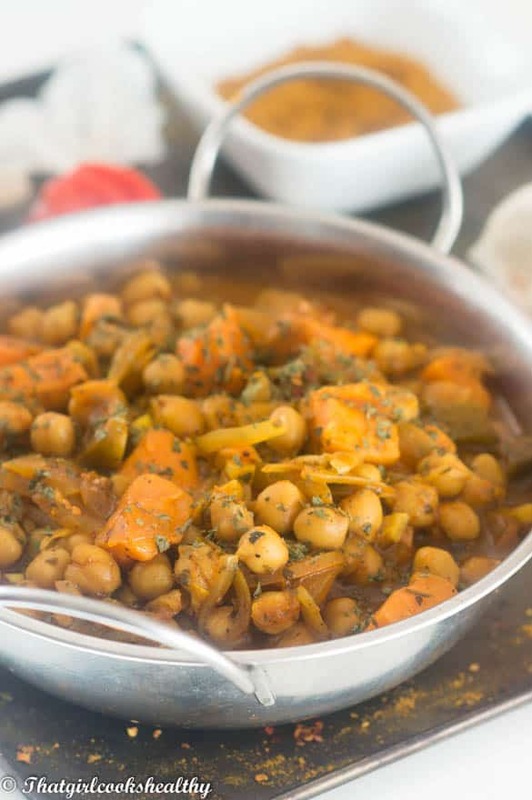 You will love vegan chickpea curry because………. Vegan chickpea curry is so filling and ready in a matter of 30 minutes. You can surprise your meat eating guests to a vegan inspired meal. Contains a moderate dose of complex carbohydrates and lean protein. Additional things to add to your curry……. Wondering which curries are vegan? Try these!! Add the coconut oil to the frying pan and proceed to cook the curry powder, then add the cumin, paprika and then saute the onions and garlic. Add the coriander, black pepper, pink salt and chilli. Then stir in the chickpeas, tomato and okra until soft. Now add the cumin and paprika, all the while stirring. As the curry mixture begins to reduce a little, add the onion, garlic, pepper, coriander and sautee until the onions have softened. Once the onions have softened, now is a good time to stir in tomato paste and fold in the chickpeas, okra and sweet potato. Pour the water and tapioca mix into the pan and season with salt (according to taste). Cook the curry for 15-20 minutes until potatoes are soft. During this time you will notice the sauce should have thicken and spicy flavours more concentrated. Keep an eye on the level of liquid in the pan, if the liquid level drastically drops add 1/2 – 1 cup of water. Is it possible to substitute the tapioca flour with regular flour or something else? Hi Netta. Yes you can use flour if you wish.